If you get a ticket for something like a traffic offense, it’s usually not a big deal. However, for the poor and homeless, a number of unpaid citations for minor offenses and infractions can become a major roadblock to jobs, housing and opportunities to get off the streets. 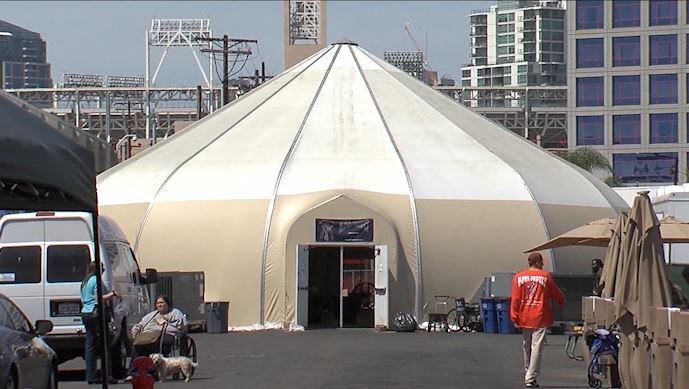 Recognizing the obstacles that some people face in resolving these court fines and fees, San Diego County’s District Attorney has joined forces with the City Attorney, the Public Defender’s office and Superior Court to bring the court to one of San Diego’s temporary bridge shelters. On Wednesday, about two dozen shelter residents waited to see the judge who moved her court to the tent shelter at 16th Street and Newton. Most of the cases involved minor infractions and some misdemeanors, for offenses such as riding the trolley without a ticket or sleeping on the street, which is a common citation for those who have no permanent housing. Bob McElroy, the CEO of Alpha Project which runs the East Village bridge shelter where the Court was convened, said when people can’t get to court or pay the fines, the citations become warrants, and then a major barrier to obtaining housing or employment. Public Defender Randy Mize said rehabilitation and a boost through the Homeless Court does more to help the individual to escape the cycle of homelessness than repeatedly going to jail and then being released to the streets. He said a trolley ticket, with added civil penalties, can wind up around $400. “When you have the inability to get a job or a place to live because you have outstanding fines or fees to pay, it makes sense for folks in the criminal justice community to offer hope and resources for rehabilitation versus the typical incarceration and fines,” Mize said. District Attorney Summer Stephan said this approach allows the justice system to work more efficiently. Instead of making multiple trips to court to resolve their case, the participant can show the judge, they’re already making changes, such as attending drug treatment or qualifying for long-term housing. Stephan said rather than going to court several times, where the judge might say,” Okay, you have these warrants, go to drug treatment, go to mental health treatment, get a job and then I’ll help you out with your fines and warrants,” the judge can dismiss the cases, if the participant shows they’re serious about ending their homelessness. “We’re getting people who are already pre-screened to have invested in their own recovery,” Stephan said. The program called Collaborative Courts is held every month, either at Father Joe’s Villages or at the Veterans Village of San Diego. This was the first time, the court was set up at a temporary shelter. Instead of being pulled down by their past, advocates for the homeless say this kind of program gives people the opportunity to move their lives forward.